The winner of the Choice award for 'Best New Hotel in Europe' in 1999, the Quality Hotel Paddington is a magnificent Choice hotel located in a quiet neighbourhood in the bustling city of London. This Quality Hotel in London is within walking distance from several attractions such as Hyde Park, Marble Arch, and the ever famous Oxford Street as well. 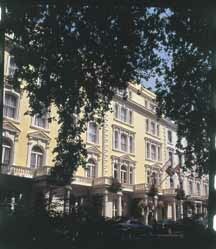 The Quality Hotel Paddington London promises some of the finest hotel accommodation in London. The hotel features 75 spacious guest rooms offering a host of luxury amenities which include cable \ satellite TV, work desk, computer hook-up, and in-room safe. Several dining options are available to hotel guests, including the Clarence Restaurant, onsite, and Garfunkel's, Frascati, and Bombay Palace, all of which are located nearby. Finding something interesting to do at the Quality Hotel Paddington London is no hassle as this London hotel is surrounded by many recreational activities, which include golf, tennis, ice skating, horseback riding and hiking. For the traveller on business, the Quality Hotel Paddington London offers several thoughtful services, including fax and photocopy services. When one couples all this with the hotel's warm and friendly service, it is not hard to fathom why the Quality Hotel Paddington London is a favourite choice among many travellers, arriving in London. The Clarence Restaurant at the Quality Hotel Paddington London offers a variety of delightful delicacies which are bound to satisfy even the most selective of palates. In addition, the hotel also features the Hotel Bar where guests can enjoy refreshing drinks.